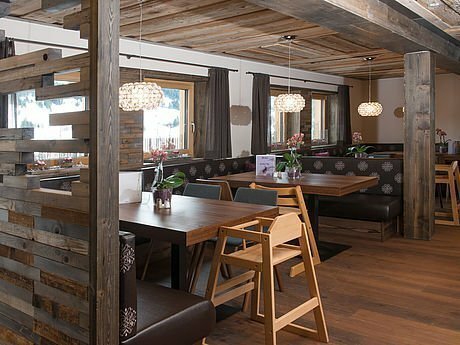 Worry-free holidays in the only Kinderhotel in the Kleinwalsertal. 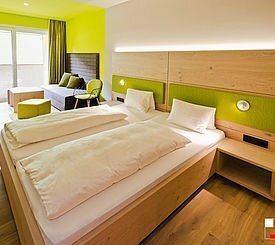 Since its refurbishment, Kinderhotel Alphotel meets the strict guidelines of a family hotel with 5 ‘crowns’. Located at 1200m altitude, away from the main road, with a breath-taking view across Hirschegg in the wonderful Vorarlberg, Austria. Ideal in summer and winter alike! You can get to us by car from Germany, e.g. from Stuttgart in around 2.5 hours, or from Munich in around 2 hours, from Switzerland e.g. Zurich in around 2.5 hours or St.Gallen 1.5 hours. 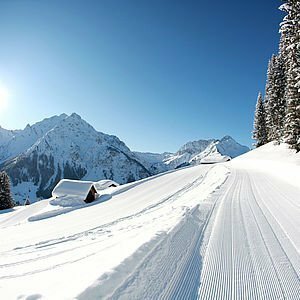 Ideal for families who ski in winter! 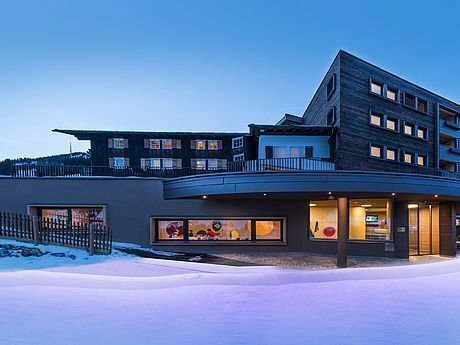 Direct access to the Skigebiet which is behind the hotel, while Skischule is just 300 metres away. 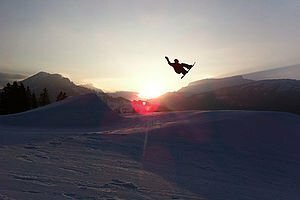 Enjoy the biggest German-Austrian ski area, which has 5 cable cars and snow-assured pistes from the start of December until the middle of April. In summer you can use all the cable cars free of charge between May and October in all Kleinwalsertaler . Relax on our spacious sun terrace, safe in the knowledge that your children will be having any amount of fun in the adjoining adventure playground. 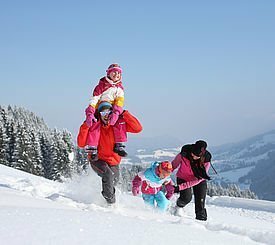 Each week 2 to 3 exciting family hikes sporty Alpine tours with expert instruction from Bergschule Kleinwalsertal. 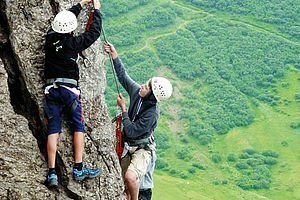 Our programme of events for adults and young people from the age of 9 gets you moving with rafting, wakeboarding and waterskiing, canyoning, mountain biking, climbing and much more. 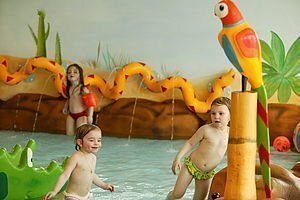 Since the refurbishment of Kinderhotel Alphotel we are open year-round for you, 365 days. Children. Parents. Grand-parents. Holidays which are fun for everyone! All family rooms and 2-3 room apartments are tailored to suit your individual requirements. You’ll also feel all-round good with our Alphotel luxurious board: substantial buffet breakfast, afternoon snack, afternoon coffee and cake as well as hearty snacks; non- alcoholic drinks from our juice fountain round the clock and in the evening there is a 4-course menu to choose from. Our Supervision team provide 60-70 hours of child supervision for children from the age of 2, including a table for children to have their meals in the children’s restaurant and 40 hours per week of supervision for infants from the age of 0, with free Hipp products, for hassle-free family holidays. The new children’s indoor area which covers 200m2 with craft room, baby room, a room to run around in, soft play facilities, ball pool and our natural play area which has a giant sand pit area, climbing wall and mini wild stream, invites children to let off steam and play. 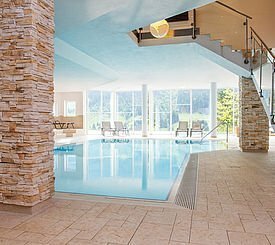 Alphotel swimming paradise: Our state-of-the-art indoor swimming pool with a water temperature of 30°C and also a separate splash pool for children provides all-round swimming fun for all the family. 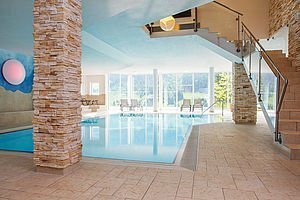 Discover pure relaxation during a massage or in our Finnish sauna, the salt-water grotto and the beneficial thermium, which has a spacious quiet room.